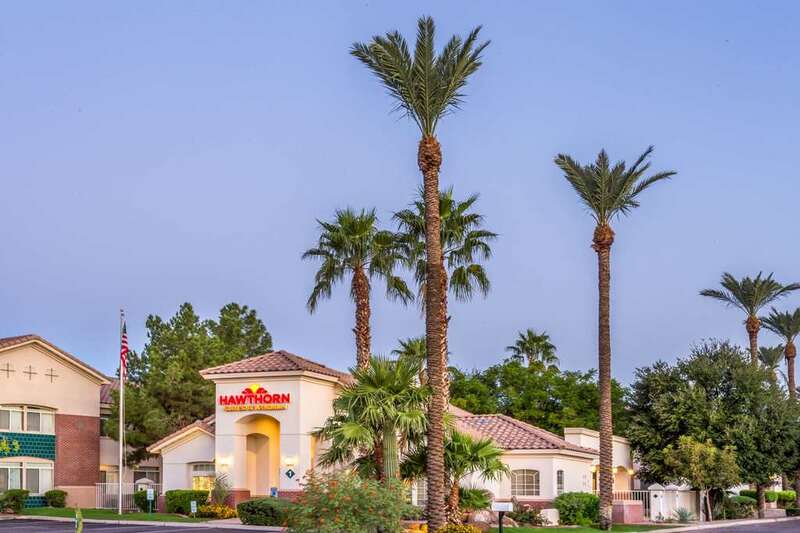 Enjoy your time in the sun at this Hawthorn Suites by Wyndham Chandler/Phoenix Area hotel, convenient to downtown Phoenix, Interstate 10 and Loops 202 and 101, and just 12 miles from the Phoenix Sky Harbor International Airport. You will enjoy complimentary wireless Internet access and the complimentary hot breakfast buffet, as well as the laundry facilities, dry-cleaning services and complimentary parking for all kinds of vehicles. Relax in the spacious rooms with full kitchens and 32-inch flat-screen TVs, and splash in the heated outdoor pool and hot tub, and cook up dinner on the barbecue grill. Business travelers will appreciate the meeting and conference rooms, presentation equipment, business center with complimentary wireless Internet, and printing and fax service. Dogs are welcome with a maximum weight of 30 lbs. ADA defined service animals are also welcome at this hotel. There is no charge for children through age 17 when staying with an adult.